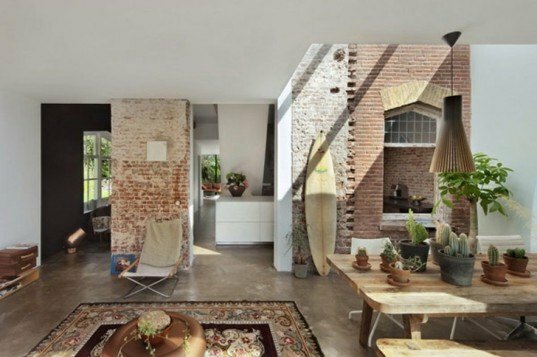 The Rail House, a historic railway cottage in Santpoort-Noord, The Netherlands, is a modern restoration by Utrecht-based Zecc Architecten BV and ZW6 Interior from Santpoort. 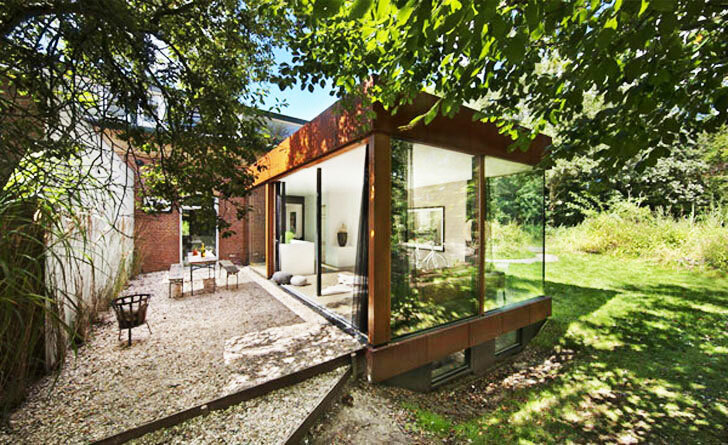 Built of glass and Coreten steel, the home is located on the railway line between Amsterdam and IJmuiden, engulfed by views of the National Park South Kennemerland. Like many of the historic renovation and reinterpretations that Zecc Architecten performs, the extension sits well with the original structure, and the historic nature of the cottage shines on. The two-story brick volume of the old cottage expands dramatically through the straight lines of Coreten steel to contrast the building with the softness of the surrounding greenery, and the ancient cottage’s walls are literally broken by the penetrating steel volume. Though the exterior of the home provides contrast in dramatic fashion, the interior of the house expands with an open floor plan. The interior’s white walls and ceilings help to give grandeur to the living space of the home. The floor to ceiling glass walls of rooms, such as the living room, provide the perfect extension of the occupant to natural surroundings. The orientation of the volumes of the new building allowed for the family to create a master sweet below grade on one of the new Coreten steel wings. High clerestory windows provide a lot of light for this underground master. Through a staircase, the occupants emerge through the living room and into the galley kitchen within the old cottage. A small loft bedroom resides above the kitchen in the arching gabled attic of the cottage. There is not a single angle in this house that doesn’t exude the personality of the old railway cottage. The inventive reuse of this historic railway cottage can be seen as an innovative and sustainable way to reuse materials for new construction. The structure of the cottage was in great condition and this provided the architects the ability to slightly modify the walls for the new addition. The character of the old bricks help to bring so much security to the building. One can only imagine the kind of history that would be expressed if those bricks could talk. The two-story brick volume of the old cottage expands dramatically through the straight lines of Coreten steel to contrast the building with the softness of the surrounding greenery, and the ancient cottage's walls are literally broken by the penetrating steel volume. Though the exterior of the home provides contrast in dramatic fashion, the interior of the house expands with an open floor plan. The interior's white walls and ceilings help to give grandeur to the living space of the home. The floor to ceiling glass walls of rooms, such as the living room, provide the perfect extension of the occupant to natural surroundings.